This week in class we did an experiential exercise on compassion. 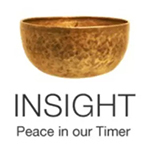 After meditation practice, we sat in the resulting inner peacefulness and each explored our circular thinking around the holidays or anything else that might be causing stress right now. Meditation offers a timelessness, so that we can see in ‘slow-motion’ how the thoughts spiral from statement to associative image representing a past experience perhaps to an associative emotion to an associative sensation, etc. By creating a spacious field of awareness — not pushing anything away but making an effort not to become entangled in them either — we give ourselves truly valuable information — the best gift of the season! After the exploration reveals something of interest, we focus on holding what has been revealed in compassionate curiosity. Developing compassion and loving-kindness is the most important aspect of any self-exploration. Without it we are like bulls in the proverbial china shop. With spaciousness and compassion we can discover the ways we activate suffering in our lives and are able to hold it gently and see it clearly, from a spacious perspective that understands the universality of whatever we notice. In this way what appears is not threatening, nor is the idea of letting it go. It is simply a natural mental phenomena that arises and falls away. Even the tightest tangles, as uncomfortable as they are and as easily as we get lost in them, are still just natural mental phenomena — in most cases leftover patterns that were created out of perceived need, but that no longer serve us, and in fact now keep tripping us up. This ability to see clearly with compassion is the greatest gift of meditation for self-exploration. In our class discussion afterwards we explored the patterned reactions to situations, people, etc. in our lives that we noticed arising. This kind of discussion is quite different from sharing the ‘story’ — the details, the ‘he said, she said’ — that we might talk about with friends or family. Here we share the universal experience of our process of exploration and discovery rather than what can amount to gossip and too much distracting personal information. In this way we are all helped to recognize the common patterns we all experience rather than getting caught up in the personal particulars that vary from person to person, that might throw us into the pattern of wanting to offer advice to ‘solve’ a problem. We are practicing the development of a practice that brings about skillful long term insights. Solving a specific problem leads us to believe in the ‘if only’s of any situation. If only I could fix this, then I would be happy. Baloney. We are not about fixing situations. Another situation will arise that seems just as problematic. The skill we are developing is how to be in skillful relationship with all the situations that might arise in life. No particular situation or person is the cause of our suffering. The cause is the pattern of reacting and the tangled circular thinking that create sticky cobwebs in our minds that are simply universal mental phenomena. It is for the most part fear-based reactivity developed when we were young that is no longer useful, as we now have more skillful compassion-based means to resolve challenging issues and dissolve suffering. It is not who we are, so we can look at it dispassionately, without feeling threatened, accused, or fearful of losing identity. Here we are approaching the winter holidays that for so many of us add a whole additional layer of stress and expectation to an already busy life. One student noticed that she felt she had to give a ‘command performance.’ This resonated through the group, and perhaps it resonates with some of you as well. It prompted a whole discussion of the ways in which we demand perfection from ourselves. If this does resonate, either around the holidays or simply in life, bring to mind occasions when you have had a really great time at someone else’s home. Was it because the silverware was shiny or the guest soaps and towels perfectly aligned? Of course not. Often the best times are had in homes that feel less formally prepared. Energetically there is less tension, less special effort for us as ‘guests.’ The hosts are genuinely happy to see us, are fully present to enjoy being together, and this makes us feel more welcome than any special preparations. We can also remember that we are always, even if we are completely unaware of it, modeling behavior for others. If we demand perfection of ourselves, are we not saying that this is the standard by which we will judge them? So letting go of this ‘command performance’ demand on ourselves releases it from others as well. Now that’s a real gift! How do we become skillful during such periods without losing the joyful social nature of the season? This is something each of us can discover through noticing what aspects bring joy, what aspects bring anxiety, and where do we over-effort to little effect. It’s skillful to make notes about what worked and what didn’t, a message to ourselves ten months into the future. And it’s skillful to keep the conversation open and in flux about what traditions are working for our ever-changing families and other groups we may celebrate with. Tradition is heart-warming but may become oppressive, the way a cozy room can, at another time, seem suffocating. Notice what’s true for you and inquire what’s true for your loved ones! Our meditation practice creates the space to quiet down and notice what is happening in our minds and in our lives. Once we see clearly, with infinite compassion, we are empowered to shift, enlighten and illuminate every season of our lives. This entry was posted in compassion, holidays, http://schemas.google.com/blogger/2008/kind#post, loving kindness, perfectionism, self-exploration on December 11, 2011 by Stephanie Noble.